It is 2008, and thirteen-year-old Shannen and the other students at J.R. Nakogee Elementary are tired of attending class in portables that smell and don’t keep out the freezing cold winter air. They make a You Tube video describing the poor conditions, and their plea for a decent school gains them attention and support from community leaders and children across the country. Inspired, the students decide to turn their grade-eight class trip into a visit to Ottawa to speak to the Canadian government. Once there, Shannen speaks passionately to the politicians about the need to give Native children the opportunity to succeed. The following summer, Shannen is nominated for the International Children’s Peace Prize. Her passion and that of the other students makes politicians stand up and take notice, and becomes a rallying point for the community and for the country. Shannen will never see her dream fulfilled. Tragically, she was killed in a car crash in 2010. Her family, friends, and supporters are continuing to fight and to honour her memory as they work for equality for children in communities everywhere. Character: Respect, Equality, Teamwork, Taking Action, Empathy, Fairness, Responsibility, Perseverance, Determination, Advocacy, Kindness, Caring, Honesty, Compassion. The contaminated J. R. Nakogee School is being demolished nine years after it was condemned. 1. What does your school mean to you? Compare what it would be like to go to school that is portables to a school that has portables. How would it be the same? How would it be different? 2. What is an ice road? Imagine what it would be like to live in a community without roads coming into and out of the community. 3. What is likely to happen if your school is contaminated with diesel fuel? How would you and your family feel if the government refused to acknowledge the problem? 4. What effect did the contamination and the failure to remedy the situation have on the community? Shannen arrives at school on a cold morning before Christmas in 2007. Before class begins, the grade eight students talk about the new school and their grad trip. 1. Give at least five character traits of Shannen's personality. 2. What is a reserve? What level of government is responsible for the reserve of Attawapiskat First Nation? Imagine what it is like to live in a fly-in reserve without malls, movie theatres, restaurants, and only one big store. 3. Why does Jonah seem angry? 4. List traditions of Cree culture. What are some cultural traditions in your family? 5. What is a ‘second-class citizen’? When Shannen arrives home with two friends, she is greeted by her great-grandmother who has made bannock. Shannen recalls conversations with her Jaban about life in the old days. Her parents and older sister and brother arrive home with the disappointing news about the broken promise of a new school. 1. List ways that life changed for Aboriginal peoples during the last century. 2. What is mercury poisoning? Why is there a problem of contamination in the north? 3. Bannock was introduced into the diet of Aboriginal peoples by the new settlers from Scotland. What else did the newcomers introduce that was useful to the indigenous population? What did the first settlers introduce to the newcomers? 4. What do elders contribute to society? Explain why their contributions are important. What role do elders play in your family? Shannen expresses her anger and disappointment at the news that the school will not be built. Her father encourages his children to not give up hope. 1. What is the James Bay Treaty #9? Why did Shannen's ancestors sign the treaty? 2. What is the Department of Indian Affairs and Northern Development (INAC)? The name has changed since 2008. What is it called now? 3. Why does Shannen feel that the government’s decision discriminates against First Nations children? 4. What are the Seven Grandfather Teachings? Why are the qualities of bravery, respect, wisdom, love, truth, honesty, and humility important? What would the opposite qualities be? Suggest other character qualities that you admire. 5. What messages is Shannen's father teaching his children? 6. Shannen does not like broken promises. Have you ever experienced a broken promise? How did that make you feel? Chapter 4: We Won't Give Up. At school the next day, Shannen and her classmates talk about their feelings about the broken promise. After Shannen suggests that they should not give up, the students decide to stage a protest. 1. Why was Shannen bothered by the reaction of the other students? 2. Kiribati is an example of a poor ‘developing’ or ‘third world’ nation. Canada, by comparison, is a ‘developed’ or ‘first world’ nation. What are the differences between the two? 3. Charlie Angus is the NDP Member of Parliament for Timmins/James Bay. What does NDP stand for? What is a riding? What level of government is he in? Why is his riding so large, the size of Great Britain? 4. Explain the difference in attitude before and after the students' discussion. Shannen talks with her family about the community’s protest to close the contaminated school in 2000. Later, the elders discuss the student’s plan to protest at a community Feast. 1. What are the principle teachings of the Medicine Wheel? Why is the number 4 important? List other things with 4 elements, e.g. the seasons, the directions, etc. 2. What is a residential school? 3. What does the quotation from the Bible-- Out of the mouth of babes and sucklings thou hast perfected praise--mean? 4. Explain what Andrew's advice about 'What-ifs' means to you. Have you ever worried about something that never happened? The students and teachers stage their protest during the visit of the National Chief. MP Charlie Angus visits the grade eight class to express his support for their campaign and offers to help. 2. What is apartheid? Why did Charlie Angus use the term educational apartheid? 3. The National Chief states that, "Canadians don't know what's happening here (on the reserve)." Do you think this message is true or false? 4. What is the message of this chapter? Adults are willing to help young activists. Why is their help important? The grade eight students watch Charlie’s YouTube video and the debate with the minister during Question Period. Their enthusiasm and hope is growing. 1. "Canada is rich and we can't find a way to provide schools for First Nations people." Explain. 2. Watch the video made by Charlie Angus. (see links #1) How did a You Tube video help the campaign? What other types of social media help raise awareness? Why are young people better at this kind of technology? 3. Who is John Lennon? What are the lyrics to Stand by Me? Why did he use that song for his theme? 5. Why is working together important? Have you had experience when working together has been successful? What are the challenges of working together in a team? The grade eight class finally decide their grad trip destination. They learn about an education rally at a school in Fort Albany in support of their campaign. Carinna gives an assignment to write a speech. Shannen is heartened by Serena’s offer to help. 2. Discuss the importance of writing a letter to the government to ask questions or voice an opinion. 3. Serena describes how she had the courage to speak to government politicians because she was speaking out for her rights on behalf of all the children in Attawapiskat. Can you name others who have stood up for their rights? Shannen attends the education rally at Peetabeck Academy. Although she loves the school, she discovers that her education is not up to par. Later, Serena tells Shannen that she has decided to go to high school off the reserve for Grade 11. 1. Why did Shannen feel gloomy when she saw the classrooms at Peetabeck Academy? 2. Traditional dancing, singing, and drumming are important in Shannen's Cree culture. Why? Compare and contrast traditional art forms in your culture. 3. What effect did the Sacred Fire rally have on the participants? 4. Why was Jaban unhappy with Serena’s decision to leave the reserve for a good education? How would you feel if you had to leave your home and family to go to a school far away? After Shannen tells the class about the Days of Action protest rally in May, Jonah suggests that the class go to Ottawa to speak with the Minister of Indian Affairs. At first the class was sceptical but soon they agreed. Their parents and school board needed convincing, but in the end they gave their blessing. 1. Why are peaceful protests effective? 2. The students presented their arguments together as a group to their parents and teachers. Why was this effective? Imagine what might have happened if they didn’t stand up together. 4. Cree people believe that kindness is important. What effect does kindness have on others? Why is kindness important to you? Shannen daydreams about meeting the minister and convincing him to promise a new school. In April, the residents leave the reserve for the annual goose hunt. 1. What is a racist? 2. Hunting is very important for First Nations communities in the north. Why? 3. What traditional food do you eat in your culture? 4. The Cree have lived in the James Bay area for thousands of years. How many years have your ancestors lived in Canada? 5. Some Canadians believe that the residents of remote northern reserves should move south for a better life. List reasons why the residents of Attawapiskat might feel differently. Shannen visits the high school Serena wants to attend and decides that she wants to go there, too. Her parents and Charlie give their consent. Shannen begins to write her speech for the meeting in Ottawa. The students spend a couple of days in Muskoka, and then arrive in Ottawa to stay at a university campus. 1. Charlie Angus’s quote talks about the diamond mine nearby. Why is the presence of the rich mine on Cree land of significance? 2. How does the geography in Attawapiskat compare to that of Muskoka? 3. The students’ arrival in a large city could be described as “culture shock’. Have you ever been to an area that was very different from what you were accustomed to? Shannen, Chris, and Solomon give speeches at a press conference. Later, they meet with other students from the south who have travelled to Ottawa to present letters of support to INAC. Jonah is encouraged to attend the meeting with the minister the following day. 1. What does it mean to be on “unsurrendered Algonquin land”? 2. Watch the video of the press conference. (See video link #3) Why were the speeches effective? 3. Explain, “Never doubt that a small, thoughtful group of committed citizens can change the world. Indeed, it is the only thing that ever has.” Can you give examples of this? 4. Can you give examples of actions that are “grassroots”? 5. Why was Jonah reluctant to attend the meeting? Which of the Seven Grandfathers would be the most help? 6. Shannen said, "Nothing is stronger than love." Why do you think love is important? The meeting is held in a large, rich looking room, on which Shannen boldly comments. The minister refuses to promise the students a new school which upsets Shannen. When the minister leaves, she vows that the students will not give up. 1. How would you describe Shannen’s emotions and character during the meeting? 2. The minister says that there are many other communities with even greater needs for a school. They need priority. What is your reaction to the reasons given by the minister? 3. Why is it important to the students to have the minister visit Attawapiskat? Shannen is very upset after the meeting but her friends, family, and elders help her feel better. They participate in the protest march to Parliament Hill. At the end of the event, Shannen is given the opportunity to speak. 1. The opening quote suggests that the government would treat urban dwellers differently. Do you agree or disagree? Explain. 2. First Nation peoples consider what will serve the seventh generation ahead of them when they make decisions about the future. Why do you think this is a good idea? Can you think of any decisions being made by our leaders today that are not considering future generations? 3. How have Shannen, Jonah, and Chris changed by their involvement in the campaign? Which of the Seven Grandfather Teachings would describe their character? After the students arrive home, Shannen receives a call from Cindy Blackstock who asks if she would consider writing a letter to the United Nations Committee on the Rights of the Child. The prime minister of Canada makes a public apology to all First Nation, Inuit, and Métis people for the government’s policy of forcing children to attend residential schools. 1. What is the United Nations? What is the Convention on the Rights of the Child? Name rights that children have. 2. What is an activist? Can you name some well known activists in Canada and around the world? 3. Why did Canada apologize for the policy of forcing children to attend residential schools far away from their family? Do you think the country needed to do that? Explain your answer. 4. Why do you think many First Nations reserves have a history of problems that are listed in Did You Know? For example, why is there a problem of obesity compared to the non-native population? 5. Can you think of ways to end poverty on reserves? 6. Why is it important to have all three characteristics of knowledge, passion, and spirit to accomplish great things? After the grade eight graduation, Shannen is contacted by Cindy Blackstock about her plan to nominate Shannen for the International Children’s Peace Prize. Shannen spends the summer on a rollercoaster of emotions as she anticipates her move from home. 1. What qualities do children possess that makes them great activists? 2. What would you miss if you had to leave home to get a good education? 3. Why are friends important? Shannen finds high school challenging and she suffers from homesickness. Soon, she makes friends and catches up in her school work. 1. What is a Powwow? Why are they important to the First Nation? 2. What is a role model? Give other examples of role models. 3. Do you have dances particular to your culture? Shannen and Serena give speeches at the human rights forum in Toronto. They enjoy a trip home for Christmas. 1. Who is Rosa Parks and why was her action so significant? 2. Shannen uses the imagery of a wave to describe growing support. What is this use of imagery called? Can you think of another image that would describe this? Shannen returns to Attawapiskat for March Break. The school has been demolished releasing toxins into the air. The leaders want evacuate the residents because of the danger, but the government refuses to help. Brendon is killed in a hunting accident. 1. Why was J. R. Nakogee School so important to the community when it was built? 2. Describe the emotions felt by the community during the demolition. How would your parents feel about the danger of the toxins so close to the portables? 3. Why did Shannen “'pounce on her friends” when they complained about their school and families? Shannen tries to cope with her grief and disappointments. A year after she spoke at the human rights rally, she gives another speech to a labour union. 1. The chapter opens with a Cree proverb. What is a proverb? Give examples of other proverbs. 2. The sewage failure affected five homes and displaced over one hundred people. Explain the problems created by this disaster. 3. How has Shannen changed over the past year? 4. Shannen knows that Canada gives aid to countries facing hardships around the world. How does that make her feel? 5. What are passivity and indifference? Shannen and Serena hear about an elder protesting being homeless by walking 160km in the winter. Shannen breaks down in despair. 1. Why do you think Shannen is feeling discouraged about the fight for a new school? 3. Why do you think education is important? Shannen feels better after a heart-to-heart talk with her father. During a shopping trip, she learns that Attawapiskat is finally getting a new school. 1. Why is family important? 2. Why did Shannen react to the good news by dancing? 3. Make a list of people and events who helped achieve success for the campaign. Everyone affected by Shannen is devastated by her loss. 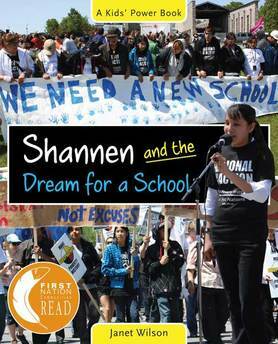 Shannen's Dream is introduced into the House of Commons to address the underfunding of First Nations schools. Chelsea speaks at a ceremony that honours Shannen Koostachin with a human rights award. 1. What important lessons did Shannen teach others? 2. Chelsea said that Shannen was inspirational. Explain. 3. Explain: "One spark can light a fire." 4. Why is it important to work together to support a cause? 1. What did you learn about Aboriginal history that you did not know before reading this book? 3. What are your dreams for the future of First Nation reserves like Attawapiskat? 1. Research and create a timeline of significant dates leading up to the building of the new school including important events that have happened since the book was published. 2. Create a timeline of significant dates in your own life. 1. What are the different levels of government in Canada? What are the names of the national parties? 2. What is the new name of the Ministry of Indian Affairs? Who is the present minister? What are the responsibilities of the ministry? 3. What are the levels of First Nation government? Who is the present National Chief? 4. How has Canada included the First Nations in their government? How have they excluded the First Nations? 2. Write a different ending for Shannen and the Dream for a School. 3. Write a letter to one of the main characters of the book. Tell him/her what you admire about him/her. 4. Ask a member of your family if they ever fought for a good cause. Write the story with a beginning, middle, and ending. 5. Write a poem from the point of view of one of the main characters. What, Where, When, Why, and How. Be sure to include a headline that will grab the reader’s attention. 8. Write a persuasive letter to the Minister of Indian Affairs about equity in education and building new schools for reserves that need them. 1. Write a speech. Some topics could include equity in education for First Nations children, the legacy of residential schools, or the future of the Indian Act. 1. The Indian Act: The past, present, and future. 2. Residential Schools and their legacy. 3. Here is a map of North America when the last glacier receded. Study the routes the original settlers took to inhabit the continent. What other routes did people take from Asia to the Americas? 4. Making a difference. Find out about an organization that is supporting efforts to improve Aboriginal education. 5. Each Nation has unique cultural practices, languages, spiritual beliefs, and traditions. Compare and contrast different First Nations. 6. Write a short biography about the life of a First Nation, Métis, or Inuk person. 7. Research what has happened to the Shannen's Dream campaign since Shannen died. 1. Choose a scene from the book. Illustrate it in any medium that you choose. 2. Choose a scene from the book and write it in the form of a graphic novel or comic strip. 3. Look for protest signs, posters, banners in the book's photographs. Create an original slogan and image for equity in Aboriginal education. 1. Role-play the scene when Shannen met the Minister of Indian Affairs in his office on Parliament Hill. 2. Act out your favourite scene from Shannen and the Dream for a School. 3. Re-create a debate in the House of Commons. 1. Find a recipe for bannock. Make some for your class to try. 1. Watch some YouTube videos made by students. Create your own. 2. Watch videos of Question Period in the House of Commons on YouTube. What is your opinion about the behaviour of the politicians? 1. Find an example of Cree drumming and singing. Compare with music from other students' cultures. 2. Charlie Angus wrote and recorded a song about Shannen Koostachin called Diamonds in the Snow (http://www.youtube.com/watch?v=IThwsiXhKa8) Write original lyrics to his verses. What were you thinking? Didn't you know? Little diamonds, diamonds in the snow. She gave you diamonds, Diamonds in the snow. ‘Cause you judge your life, By what you can own. Touch these diamonds, Diamonds in the snow. Read the Canadian Geographic story, "Still Waiting in Attawapiskat"
Janet Wilson has more than 50 books to her credit and a list of prestigious national and international awards for both writing and Illustration. Inspired by the philosophy of Gandhi, “To reach peace we must begin with the children”, Janet creates books to motivate and empower young readers to make a positive difference in the world. One Peace: True Stories of Young Activists, is the first in a series of books about the power of youth, based on examples from around the world, followed by Our Earth: How Kids Are Saving the Planet. It was while researching the third book, Our Rights: How Kids are Changing the World, about young international child-rights activists that Janet learned about Shannen Koostachin from Attawapiskat First Nation, who had been nominated for the International Children’s Peace Prize. So compelling was the story of the young student's fight with the Canadian government to get a real school, Janet decided to write a novel, Shannen and the Dream for a School, based on the true events. In June 2012, she was awarded the First Nation Communities Reads Prize. Janet Wilson’s books combine her passions for painting, particularly portraiture, and non-fiction that is inspiring, intergenerational, culturally inclusive, and international in scope, addressing important global issues of non-violence, environmental protection, indigenous rights, and social justice. Janet lives in Eden Mills, Ontario.